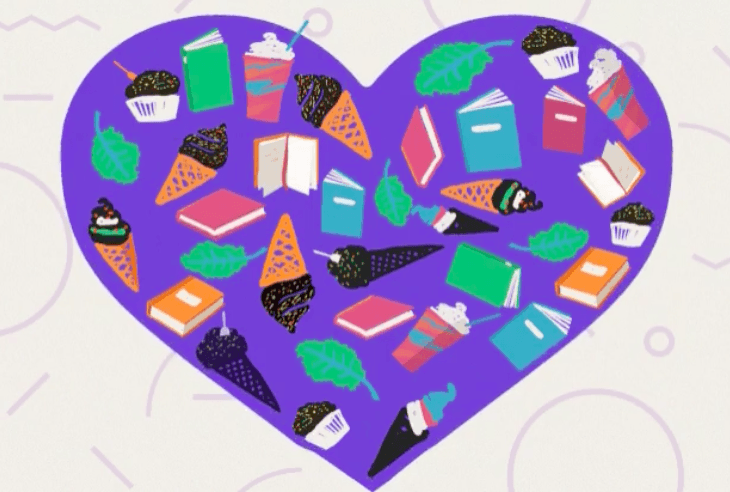 The mysteries of consumer behavior, explained by ice cream and independent bookstores. A food trend arrived two summers ago in the neighborhood of Toronto where I live that continues to beguile me for its endurance. In an area with several fantastic ice cream options, the longest and most consistent lineups are for a place specializing in charcoal-infused ice cream. It tasted no better than your average soft-serve, it looked like poop and stained your teeth black, and it required a half-hour wait just to get a cone. The health benefits associated with charcoal-infused foods are dubious quackery at best, especially in ice cream, and yet every day there’d be dozens of people standing outside, taking selfies with their cones, which they took three licks of and promptly threw away. 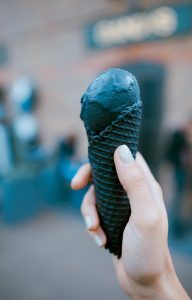 The charcoal ice cream trend had nothing to do with taste, however. Like its recent cousins the unicorn latte, the rainbow sprinkle cake, or other viral sweets, it was consumption purely as visual entertainment, a food trend tailor-made for Instagram feeds. Similar to shopping for new shoes you don’t need, or buying trinkets on vacation, it is an act of commerce used to pass the time on a sunny Saturday. It also was an act of social bonding, between those standing in line, their friends who had already eaten there, and their followers online, heart-tapping those poop-colored cones from screens near and far. Why do we buy the things we buy? This simple question forms the heart of a multitrillion-dollar riddle at the core of our culture of consumption. It is studied relentlessly by economists and sociologists, picked apart by sales departments and marketing firms, opined on by authors and experts, and agonized over by everyone working in the world of consumer goods, from local coffee shop owners to retail chain CEOs. Trends seem to come out of nowhere, blindsiding us each season, in a way that feels unpredictable. That’s because these shifts in the collective appetite (for everything from music and food to clothes and even politics) are driven by a force bigger than we can see: human emotion. As someone who has been looking at consumer trends and the forces that shape them over much of the past decade, when you step back and try to understand trends, you see that nearly all trends, and the buying that fuels them, are based in emotion. It makes no sense to buy a printed book instead of an e-book. But we do it anyway. A trend that personifies the centrality of emotion in consumer trends is the surprising growth of books over the past decade, especially in the United States, despite an avalanche of predictions to the contrary. Just a few years ago, experts were nearly unanimous in their belief that books and bookstores were certain to disappear. Based on all measures of logic, the predictions were perfectly sensible. Faced with the growth of e-readers like Kindles and iPads, print books were an outdated and easily disrupted technology. Paper books cost more to produce and purchase, take up precious space in warehouses, stores, and homes, lose their value immediately, and are environmentally destructive (publishing is an industry based on arboreal genocide). And bookstores? How could a brick-and-mortar space with limited selection and financial resources compete with Amazon, which sells every single book, for less than anyone else, anywhere, anytime — free shipping included? The economics simply made no sense. Just look at what happened with music and photography! There was just no reason for people to buy books. But they did. According to the American Booksellers Association, as well as publishing industry figures, sales of books and the number of new independent bookstores opening across the country have been growing steadily, year by year, since 2009. Meanwhile, e-book sales have plateaued (after peaking around 2014), and Amazon has entered the brick-and-mortar bookstore game, driven in no small part by the trend back toward books and bookstores it somehow missed. What changed? It wasn’t economics or any specific industry dynamic. It was the emotion of the consumer, which grew enough to support a trend that brought books back in favor. Like most successful trends, these emotions were deeply felt, and linked to bigger forces in our culture. At a time when few of us dare to go anywhere without a smartphone, books tapped into a growing desire among many consumers for a sense of physicality and the measured pace it commands. Like the other analog goods that have seen a resurgence in recent years, including vinyl records, board games, and even film cameras, books promised a slower, isolated experience, free from distractions, pop-up ads, dead batteries, Russians (unless you’re reading about them), and the other byproducts of digital innovation. In an age of noise, they offer the quiet many of us desperately desire. They also offered certain incalculable tangible pleasures for our senses: the oft-cited smell, feel, and sound of books, which book lovers relish with romance. In a similar way, the bookstore offered the above, in addition to something even more desirable: community. By providing actual places in cities, town, and neighborhoods where readers and book lovers could walk in, hear author talks, get personalized recommendations from knowledgeable staff, and, most importantly, just be around books and other book lovers, they provided a physical space that delivered the one thing Amazon is incapable of: a sense of belonging. Bookstores and the books they sell bring consumers into a family — a family where you share the same values, based on your buying habits. You see it with men like my father and their endless conversations about road bikes, with kids unboxing their Lego sets on YouTube, and with the kale-eating Prius driver who feels so compelled to tell other kale eaters who they are that they actually go to the trouble of putting a pro-kale bumper sticker on their Prius (as if the Prius itself doesn’t send that message). We buy as much to belong as to own. And for readers, the value of showing off their Politics & Prose tote bag or proudly holding up their copy of Roxane Gay’s Hunger on the subway is as powerful a symbol you can send into the world that I am book people as any overt declaration on social media (though book-loving Instagrammers abound). Last year, Harvard Business school professor Ryan Raffaelli decided to figure out why this was, interviewing dozens of independent bookstore owners across America, as well as publishers, authors, and industry experts. Raffaelli, who specializes in the adaption of legacy industries and previously studied the resurgence of Swiss watchmakers and pencil manufacturers, found that it boiled down to the 3 C’s: community, curation, and convening. Bookstores held events. They created safe and welcoming spaces. And they leveraged this into real, lasting relationships with their customers. “Combined, these aspects … served as important bottom-up processes that reframed the mature independent bookselling industry as a legitimate and distinct form of brick-and-mortar bookselling,” Raffaelli wrote. Donna Paz Kaufman, a publishing industry veteran whose consulting company Paz & Associates works with independent bookstores, and the people who own them, across America, agrees. Over the past few years, Kaufman’s business has been busier than ever, with more new clients coming to her every day, interested in opening a bookstore in their neighborhood and town. “It’s a little magnet for community, a place you can go and feel safe, encouraged, and feel prompted to learn something new, or you can just be,” she said. Sure, there are some logical advantages to the trends that take off beyond mere fads. Kale has endured because it’s easy to plant, cheap, and can work in all sorts of dishes. Birkenstocks made a huge comeback because they’re damn comfortable. The publishing industry defended itself better than other media industries against digital disruption because books remain relatively profitable to make and sell, while independent bookstores benefited from the demise of Borders and a defanged Barnes & Noble. But the practical factors obscure the golden rule of consumer behavior, which is that the logic of emotion triumphs above all else. Some emotions, of course, are more powerful than others. The emotions that draw us to books are strong enough to transform an entire industry. The emotions that draw us to Instagrammable charcoal ice cream, however, seem to be more fleeting. I remember sitting on a trends prediction panel several years ago at the annual Fancy Food Show with industry trend forecasters, former Food Network stars, and other food journalists, with the goal of zeroing in on the next big thing. As we discussed the green shoots of food trends we’d observed while walking thousands of trade show booths and eating more samples than a human body can handle, activated charcoal foods came up a few times. “Oh, they’ve been saying charcoal foods will be the next big thing for years,” one woman said dismissively. Everyone nodded in agreement. Even though that charcoal ice cream parlor still has a lineup, the overall trend is limited to a few shops in a few cities; you’re unlikely to see a tub of charcoal vanilla ice cream at Safeway anytime soon. In the end, we’ll try anything for emotion. But if it doesn’t taste better than Häagen-Dazs, we’ll be back eating good old vanilla the next hot day. If you need more practical information on how to avoid being caught by the waves of trends, read our article: Consumerism. Shopping. Sale Trap.